Worksheet is also called spreadsheet. It is made up of rows, columns and cells. Rows run horizontally across the worksheet and ranges from 1 to 1048576. A row is identified by the number that is on left side of the row, from where the row originates. Columns run vertically downward across the worksheet and ranges from A to XFD - 1 to 16384. A column is identified by a column header that is on the top of the column, from where the column originates. Cells are small boxes in the worksheet where we enter data. 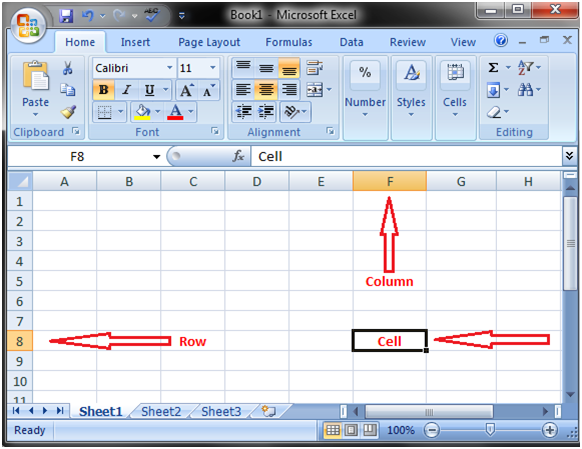 A cell is the intersection of a row and column. It is identified by row number and column header such as A1, A2.